20130513 - Up and in to work. left a little late, rushed home, changed and straight to G's first game of the season. It was a great game and the boys had a blast. J helped me with the book and G got a good hit every time he was up. 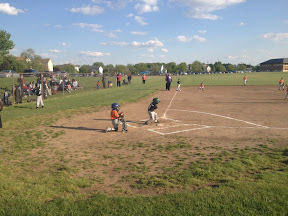 The Mets lost, but the boys were SO happy to be playing ball and outside it really didn't matter (well to G it did...;-) Home and boys cleaned up and off to bed. I got Doc and we headed to Bible Bangers. Home and up researching copyrights on Bibles... really?